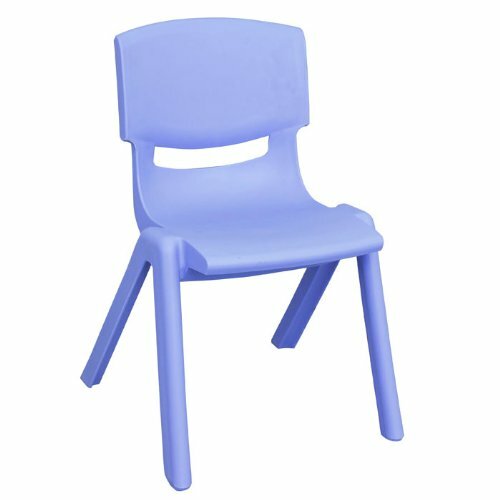 ELR-0555-BL Seat Color: Blue, Seat Height: 12" Features: -Stackable.-Available in red, green, blue, and yellow and 5 seat heights. Construction: -Constructed of solid 100pct Polypropylene. Dimensions: -Seat dimensions: 20-27.5'' H x 13.4-17.25'' W x 10.75'' D. Warranty: -3 Year Warranty. Age Level: 3 years - 7 years. Style Notes: Blue (BL). Materials: Heavy-Duty Plastic. Assembly: No Assembly Required. Assembled Dimensions: 12.80" x 15.25" x 21.60". Assembled Weight: 4.80 lbs. Other Dimensions: Seat Height: 12".